May’s Illumicrate was just the best! But before I get into what’s inside, here’s a little about Illumicrate. 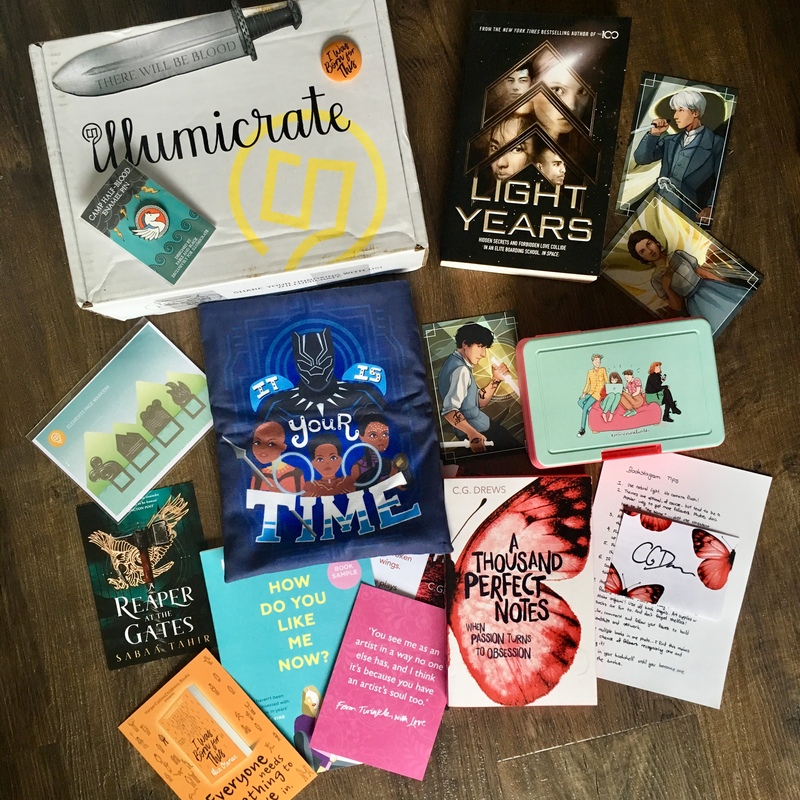 Illumicrate is a quarterly YA subscription box based in the UK. It costs £29.99 per box, with free shipping to the UK. It does ship internationally but it has shipping costs that varies depending where in the world it’s travelling to. Illumicrate contains one new release (and sometimes a bonus ARC as well) and 4-6 goodies, some of which can be exclusives. Now I had cancelled my Illumicrate subscription as I’d moved to a new house, I was now paying more monthly expenses etc etc but when I heard what some one the goodies would be related to, I knew I had to get this box. Seriously, mention Black Panther and I’m there! The first thing I saw when I opened the box was the Black Panther item. It’s a book sleeve designed by Risa Rodil featuring T’Challa, Shuri, Nakia and Okoye and I LOVE IT!!! I love the design (I’d seen some of Risa Rodil’s work before and loved it so I’m so happy I have a book sleeve by them) and how big the sleeve is. Next there was a box with Fangirl-inspired artwork by Alice Oseman. I really liked this item as it’s something I’ve not seen in subscription boxes before and it’s the perfect thing for keepsakes or your lunch. There was a Camp Half-Blood enamel pin with a pegasus on it from Fable and Black, tarot-style art cards inspired by the Infernal Devices featuring Will, Jem, and Tessa from taratjah, and a set of elements page markers from AnotherStudio_ inspired by Avatar: The Last Airbender. All of these items were Illumicrate exclusives which is pretty awesome. Also included were promotional items like pin badges, bookmarks, samplers and postcards for Grey Sister, How Do You Like Me Now?, From Twinkle With Love, I Was Born For This and A Reaper at the Gates. And there was an exclusive edition advanced readers copy of Light Years by Kass Morgan which sounds like a great, mysterious yet romantic sci-fi adventure. Now for the book. 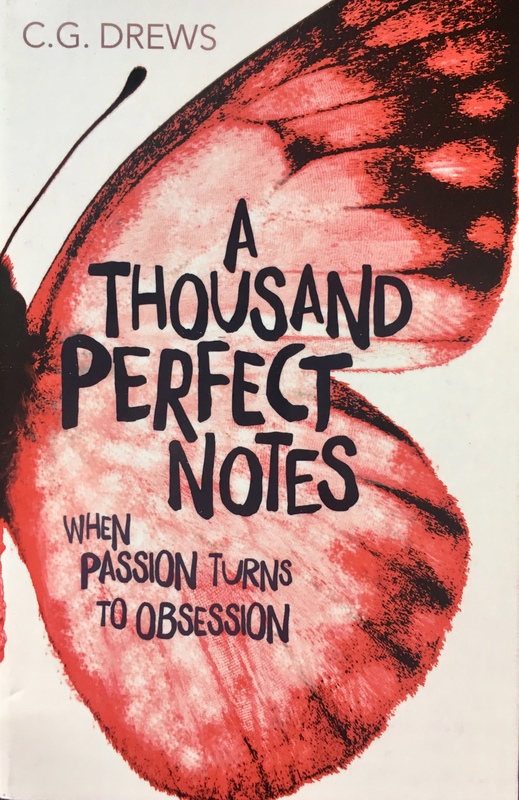 It was A Thousand Perfect Notes by C.G. Drews and this copy was an exclusive copy with red sprayed edges. It came with a signed book plate, a letter from the author and a bookmark. This is a book I’d seen murmurings about on Twitter, and after reading the blurb I can see why. It’s a contemporary story about friendship and music and overcoming parental abuse. I’m looking forward to reading it soon. I loved everything included in this quarters Illumicrate box and I think it could be the best yet. I like how it has a real eclectic mix of items from different fandoms and I’m looking forward to reading both books, especially as they are books I might not have bought myself. I think this Illumicrate box might be their best yet, it’s truly great.